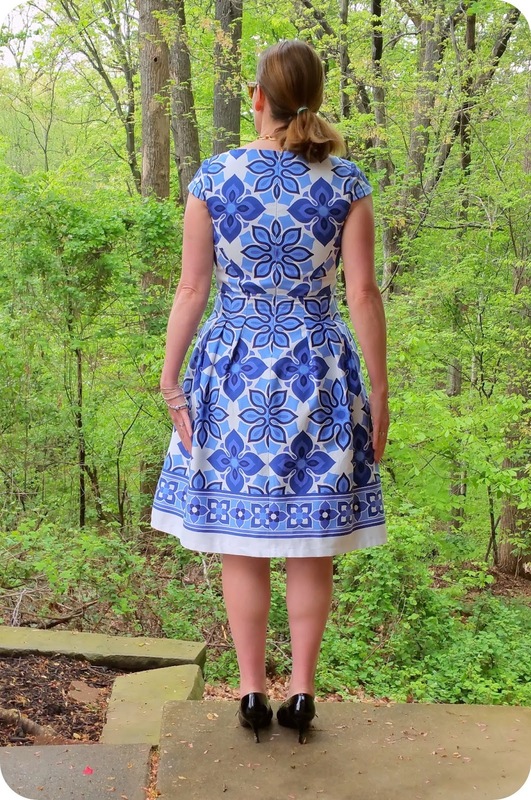 Fabric Mart Fabricistas: Made by a Fabricista: Border Prints Blues (and Whites)! 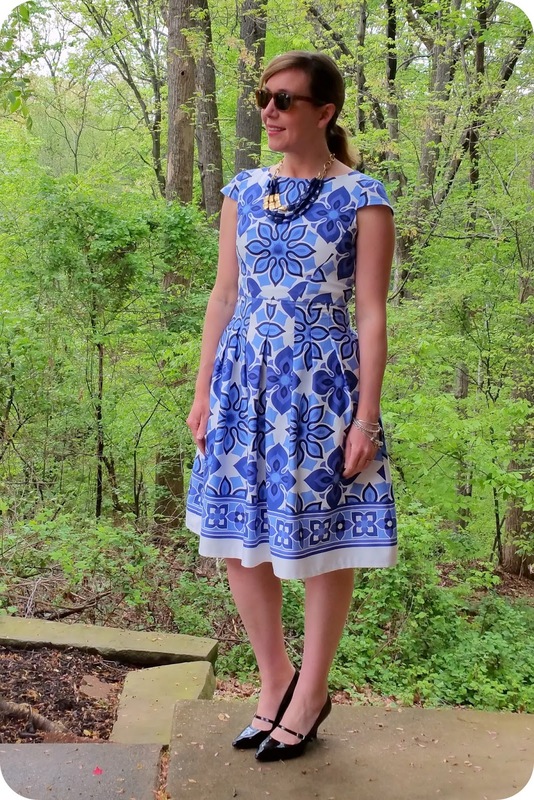 Made by a Fabricista: Border Prints Blues (and Whites)! We were asked to try and wear blue and white, and I figured I had best get on finding some blue and white fabric, because even though I have a ridiculous stash of fabric at my house (thank you, Fabric Mart! ), I didn't have any blue and white fabric. Wha? But fortunately for me, Fabric Mart at the same time I was searching for some fabric, had a GORGEOUS border printed (in what appears to be a dutch tile motif) stretch cotton sateen from Maggy London (used in a similar way as it turns out here and here for non-pinterest people). Not much was left in stock, and I was lucky to get the two and a half yards I did, which was just enough to fashion a really special dress for the occasion. I ended up choosing Vogue 1499, a cap-sleeve dress from Anne Klein. The original version is on the cover of the pattern, but there are also other versions floating around, like this one. The dress seemed to nicely fit what I desired, and even though I knew that I would have to work around some of the seaming with careful pattern placement on the fabric when cutting, that it would still look pretty and unique overall. Because this was a border print fabric, I knew that I would have special challenges when working with it, and I can definitely say that these are things to keep in mind with most border print fabric projects. 2. The bodice retained the stretch because the pattern in the center was equal and spaced the same whether up or down. I was relieved that I could make the bodice fairly fitted without losing comfort. 3. I definitely had to watch how I placed my floral motifs. Those suckers were big! If I had placed them off by a bit here or there, it would have been immediately noticeable. I think the time spent on that and the extra fabric use was very much worth it, though, since the motifs line up properly, and the skirt's hem is at the right spot on the leg. 4. I had to add pockets because the original didn't include pockets. I think that's a shame, but because the Vogue markings are similar amongst patterns, I was able to take a pocket pattern piece from another Vogue dress and make it work. The hemming part was my favorite part since the hem was at the selvedge, it required no finishing, and it was easy to visually press up and pin into a proper position. This is a bonus for working with border prints, so yeah! I absolutely loved wearing it that night, and felt like I had definitely taken on the challenge of the "Big Fat Greek" auction well. I look forward to reading more about your border print makes (include links to your photos, would love to see the projects!). Talk with you all again next Wednesday! What a gorgeous dress! Your print placement is perfection! It's PERFECT!!!! I love border prints and that color is so vibrant! I love this print and I love the fact that you have themes for your dresses! Oh my gosh! What a gorgeous dress! It looks perfect on you. You did an excellent job. I like pockets too. Because we sew we can create whatever we want! I wanted some of that fabric so bad and it sold out before I could make up my mind! Your dress is AMAZING! You picked the perfect pattern to highlight this awesome fabric! Fantastic job! Dina, this is one of my favorite dresses that you've made. It looks so lovely on you and that FABRIC!!! I LOVE THIS DRESS! It looks fab on you!!!! This dress is perfection! Great dress...great sewing technique...great explanation. Wear your dress proudly and often. Fantastic matching and placement of motifs! 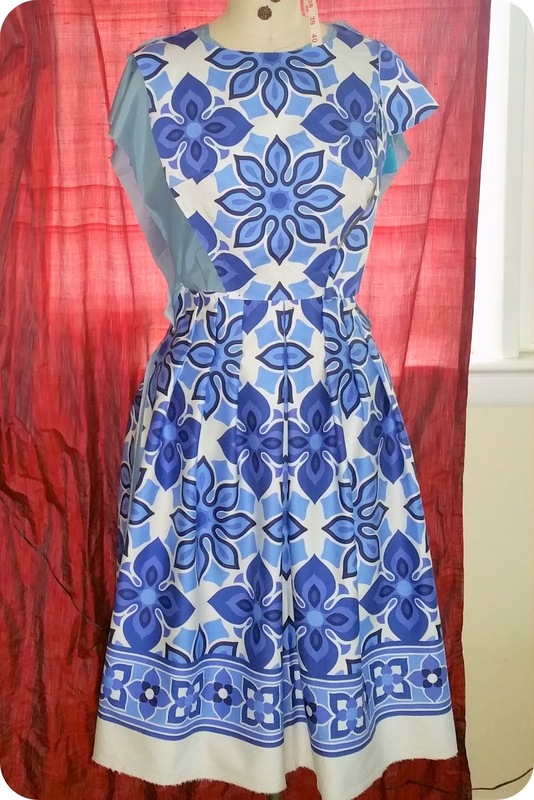 Gorgeous print and the dress fits you beautifully! You did an amazing job with this one! So creative and so beautiful! 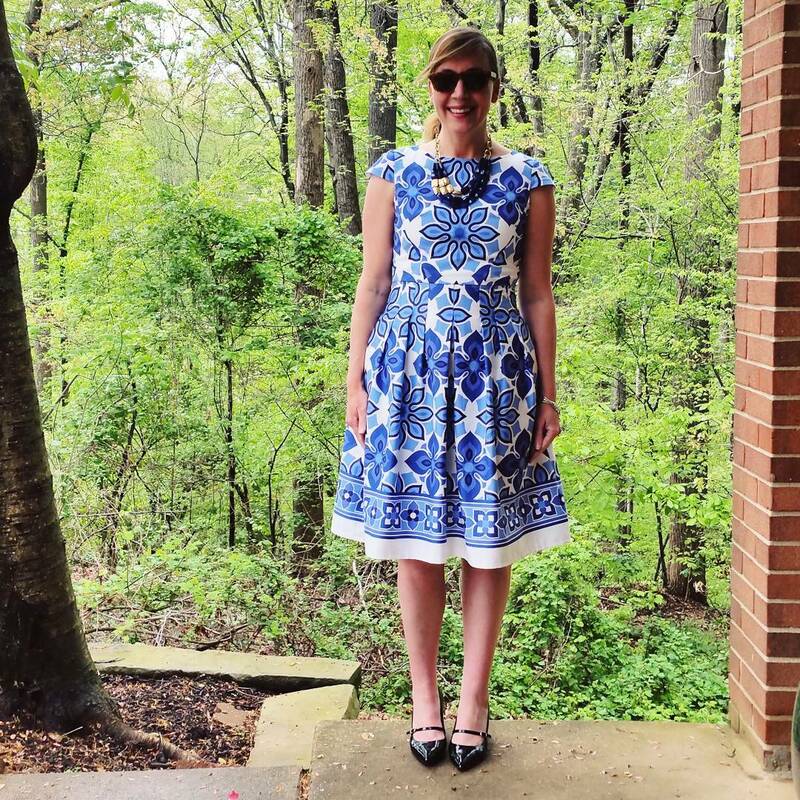 This dress highlights your best features, and you look like a model!